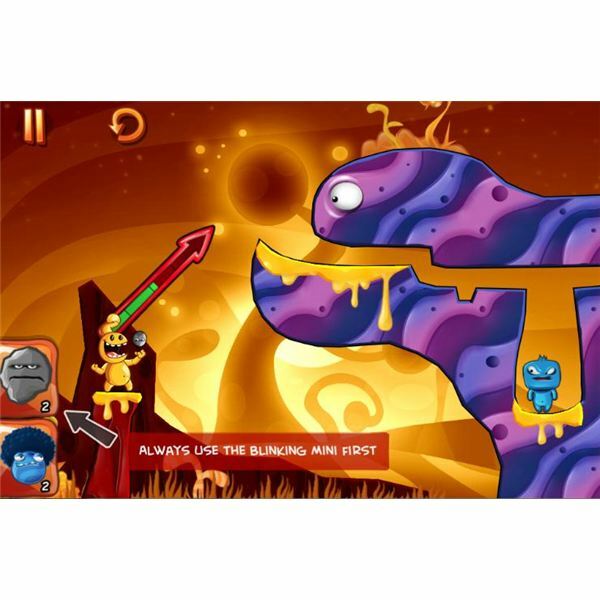 Developed by MiniClip Games, Monster Island is an iPhone action puzzle app where you enter a colorful world inhabited with rambunctious little monsters. For reasons left unknown there’s a territorial war going on. You become a cute brute trying to stop other critters that have come a bit too close. You are armed with miniature exploding monsters referred to as Minis. These make-shift bombs are propelled using a sling in order to annihilate trespassing foes. 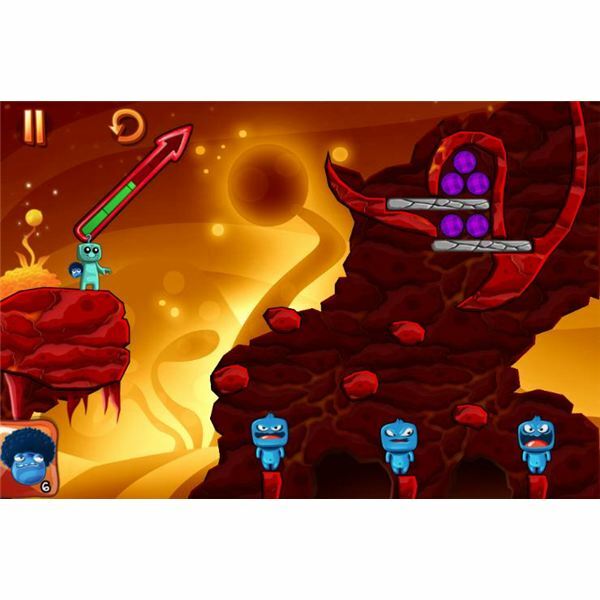 The main objective of the game is to take out the other monsters in the fewest amount of shots possible. Successfully doing so will result in a three star rating, bundle of coins, and bonus points added towards your score. Once a level is cleared the next stage is automatically unlocked. There are over 180 levels to complete in this challenging puzzler divided into chapters. The three core chapters include Yellow Jell-O, Purple Jam, and MonstroCity Island. The physics-based gameplay in this game is very similar to Angry Birds. Instead of irate pigeons users are tossing spiteful monsters. The controls and interface are relatively easy to navigate. Players simply drag their finger along the meter projectile adjusting the force or direction of the throw and then tap on their desired Mini to launch. 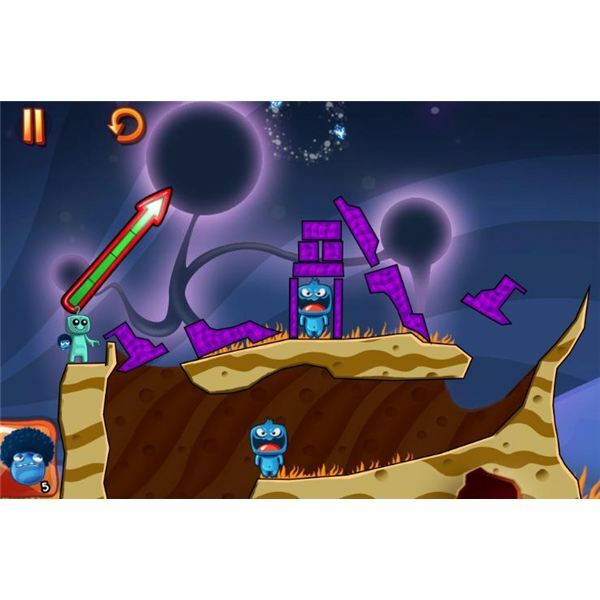 Each level is set up like a puzzle with scattered creatures placed in hard to reach areas. Players have to rely on strategy and accuracy to effectively knock or explode their unwanted guests into oblivion. There are a set number of minis available to toss in each stage. Obstacles in the form of purple stones, blue blocks, and large rotating grey rocks add a challenge requiring a combination of different minis to get through the blockade. Minis like the Sticky adhere to any object they land on, weighing it down. They can also be used to attach another mini, such as the Bomber, for an explosive reaction. As players progress monsters are hidden in stranger places from cave taverns to smack in the middle of levitating boulders. Every missed shot results in the monsters jiggling their bellies, sticking their tongues out, and random evil chuckles at your expense. It’s quite annoying. When players clear the level their monster does an adorable victory dance. Coins earned in the game can be used to purchase new monsters, skips, solutions, and unlock worlds without completing the previous zones. If you have enough coins there’s a nice assortment of cool looking monsters to choose from in the shop area. There’s no real need to spend extra money buying credits which is a welcomed plus in any app game. Overall the game is loads of fun. 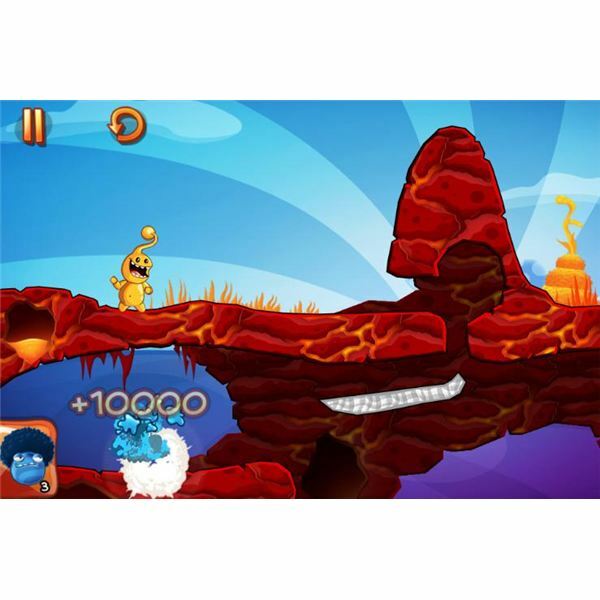 Gamers who enjoy Angry Birds will find this light-hearted action puzzler cute and equally addicting. Coins are hard to accumulate. Get the free bonus available to players who like the game on Facebook. It only takes a few minutes and can be done directly from your app. The 500 extra coins will enable users to unlock a new monster with higher abilities. Take your time. Never toss without accurately aiming. It’s important to avoid wasting minis since it can reduce your star rating. Always spend a few minutes examining the obstacle in the level first. Remember minis have to be used in the correct order to solve the puzzle. When multiple mini options are available a hint is given. When a mini’s icon flashes that particular type should be thrown before using the other. Adjust your toss options to improve your accuracy. There are two different modes. Tap to throw allows players to play around with the direction of their projectile arrow and then press a mini to throw. The release to throw mode requires users to select their mini first and then tamper with the meter lifting their finger to launch. Beginners may prefer tap to throw but either method is fine as long as you’re comfortable using it. Players are given two free skips so use them wisely. Save them for when you’re really at your wits end. Utilize the cancel option. After a toss has been initiated a player can quickly tap the X icon located at the bottom of the screen to cancel the shot in progress. It’s handy when you’ve noticed an error in mid-air. If possible aim for the monster using a direct hit at maximum impact. Consider the height or contour of the tunnels, cliffs, and caves when aiming. 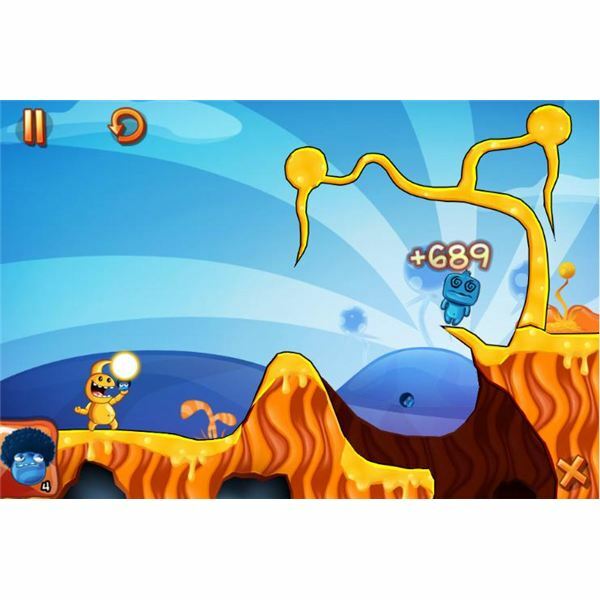 As a physics-based game the minis will often bounce or roll in either direction. Xplode or Bomber minis detonate on contact. Use precision when tossing. Blue minis do not explode instantly. There’s a slight delay allowing them to roll. Try to shoot them as close to the obstacle or monster as possible. The gray stone minis called Rockos are ideal for filling in holes and cracks in enclosed areas. When presented with multiple stones try to fill in any noticeable gaps first. Most of the purple colored obstacles are meant to be moved. Look for ways to knock them down. Flat gray platforms are usually meant to be broken. Attach Sticky minis to Xplode minis to make monsters quickly tumble to their untimely demise. Often when playing Monster Island players will find themselves either sailing through with no problems or absolutely stumped. It happens to the best of us. Practice by repeating levels that were difficult to earn a three star rating on and boost overall scores. Use this Monster Island guide and helpful tips to assist you in winning the war for funky, hip, little monsters everywhere.